In the earliest days of the Reformation, Martin Luther and other Protestant Reformers appealed to the Orthodox Church in support of claims against the Church of Rome. These appeals were indirect, intended to bolster their arguments that Roman innovations deviated from the faith of the Apostles. The Lutherans, in particular, saw themselves as not breaking from or forming a new “denomination,” but as the rightful heirs of the Western patrimony and, therefore, the continuation of the Western Church. For this reason, within the first generation of the Reformation, conversations by leading Lutherans (the largest Protestant group) were initiated with the Patriarch of Constantinople. Since their liturgical, doctrinal, and moral propositions and practices were the least radical, the initial Lutheran presumption was that there was doctrinal agreement with the Orthodox, and that any differences could be easily clarified. As history shows, that presumption was presumptuous; but it did, at least, begin a conversation which has continued in recent times. The history of this dialogue begins less than 100 years after the last serious attempted reunion of the churches of Constantinople and Rome in the Council of Florence (1438-1445). In 1517, Martin Luther publicly called for the reform in the Western churches of various moral, ecclesiastical, and doctrinal aberrations and deviations. Initially, he focused on pastoral abuses connected, in particular, with the Sacrament of Penance and living the life of repentance. When he posted his 95 propositions for debate, he expected the support of the Roman pontiff because he understood that he was offering no innovations, merely correctives. To what extent this rather young and recent professor at a start-up university knew of the Council of Florence is unknown. But one can safely surmise that, as a doctor of theology, he knew of its existence and perhaps had read or heard of some of its acts. In either case, over time, Luther and his learned colleagues would, early on and in significant instances, reference “The Greek Church,” as they called it, to support their arguments. In fact, only two years after the posting of his 95 Theses, after a famous debate in Leipzig with Johann Eck, Luther “wrote that he vigorously defended the Orthodox Church against Eck’s slanderous remarks that the Greek Church had lost the Christian faith after the fall of the Byzantine Empire.” (Mastrantonis, 10 n.1) Later that same year, he also pointed to the Orthodox Church to support his claims against papal supremacy, purgatory, the reception of only the Body of Christ in the Eucharist, the prohibition against celebrating Divine Liturgies (Masses) with no one present, and the notion of the Eucharistic sacrifice as propitiatory (rather than a sacrifice of praise and thanksgiving). 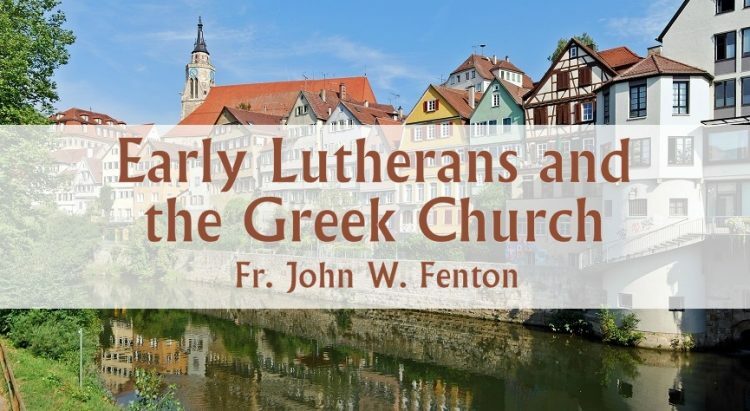 These appeals to the “Greek Church” were repeated not only by Luther but also by his colleagues, and some made their way into the Book of Concord, to which every Lutheran pastor and parish must formally pledge allegiance. The aim of these appeals was to indicate that the “Evangelical party” (as they were first known) was doing nothing new, and that Rome itself had departed from the faith once delivered. While Luther, in particular, and most of his colleagues never had or developed direct contact with the Orthodox bishops or theologians, they certainly knew of them, at least through the Greek patristic writings, and the early Lutherans assumed and expected that the Eastern churches had retained, without abuse or deviation, the ancient Christian faith. Given these appeals to the Greek Church, attempts by the nascent Lutherans to contact the Orthodox Church would not seem unlikely. If that happened is increasingly unknown, despite the oft-repeated story that Philipp Melanchthon, Luther’s “right-hand man,” worked with Orthodox Deacon Demetrios Mysos to translate the Augsburg Confession into Greek. What is certain is that there is no record of correspondence, and scant, if any, knowledge of the Protestants by the various Orthodox patriarchs until 30 years after Luther’s death. In the 1570s, when the Lutherans were consolidating their teachings, leading Lutheran theologians wrote to the Patriarch of Constantinople, sending him a copy of the Augsburg Confession (the primary and constitutive document of Lutheranism). This endeavor was led by Jacob Andreae, one of the leading Lutheran scholars, a theology professor and chancellor at the leading Lutheran university in Tübingen, and the author of several anti-Calvinist statements which culminated in the Book of Concord. In addition to his university colleagues, Andreae was assisted by Stephen Gerlach, their hand-picked chaplain to the German embassy in Constantinople. These Lutheran leaders “had some knowledge of the Orthodox Church, although they had no knowledge of contemporary Orthodoxy because of… the fall of the Byzantine Empire” in 1453. (Mastrantonis, 9-10) Nevertheless, they initiated a conversation with the patriarch because they believed that the Orthodox Church remained true to the Ecumenical Councils while eschewing the innovations of the Roman church. The correspondence was conducted by a small group of Lutheran theologians and the learned Patriarch Jeremias, who wrote his replies after consulting several advisers. It followed the outline of the articles of faith and practice found in the Augsburg Confession. The letters consisted of three official exchanges (and a number of ancillary letters), which were pointed but cordial and polite. Common ground was easily found included the doctrine of Christ, evil as caused by humans, ancestral sin and its transmission, the perpetual virginity of Mary, the efficacy of baptism, the abuses of papal primacy and supremacy, the allowance of married clergy, and communion in both species. (For a more detailed list of similarities and differences in the correspondence, see Mastrantonis, 20-24.) These, and other lesser points of agreements, were quickly dispensed by both sides in favor of focusing on disputed issues. As the dialogue progressed, two underlying themes became evident. First, the Orthodox accepted many more of the Roman teachings and practices than the Lutherans expected; for example, the number and nature of the sacraments, intercessions to the saints, and a laudatory understanding of icons, relics, and monasticism. Second, the Lutherans retained several Roman teachings and practices that had precipitated or evolved after the Great Schism; namely, the acceptance of the filioque, the use of unleavened bread, questions revolving around predestination, and the refusal to commune infants. The dialogue was desired and initiated by the Lutherans because they sought the patriarch’s agreement that they maintained the faith that always been believed. The Orthodox, on the other hand, were no longer in a position to seek reunion or continued contact with the West, and so they had little or no first-hand knowledge of the general issues and details of the dispute. The patriarch and his advisers were apparently not opposed to conversation and gave no hint that it would tread carefully so as not to offend Roman sensibilities. The Lutherans, on the other hand, too often appear to have read the patriarch’s replies and arguments within the categories and context of their conflict with Rome, rather than supposing that similar language implied similar categories and conclusions. While helped by the personal contact of Gerlach and the supplementary correspondence, it does not appear that either side made the effort to probe more deeply into the reasons for certain doctrinal formulations—for example, the context for the Lutheran understanding of “free will” or the Orthodox nuance on invoking the saints apart from a medieval system of merits. Additionally, neither side seemed to use the areas of agreement as a foundation for understanding the areas of dispute. Most regrettably, neither side apparently attempted to place the doctrinal formulae within a liturgical context by experiencing or understanding each other’s worship. No doubt, that effort alone would have raised other issues—for example, how the Orthodox resolved the apparent conflict between Christ as the only Savior while offering excessive praise to Mary, or how the Lutherans so readily presumed to excise the canon of the mass. Despite the various shortcomings, the exchange presents a pattern for respectful, humble dialogue which does not brush aside but honestly wrestles with significant differences. 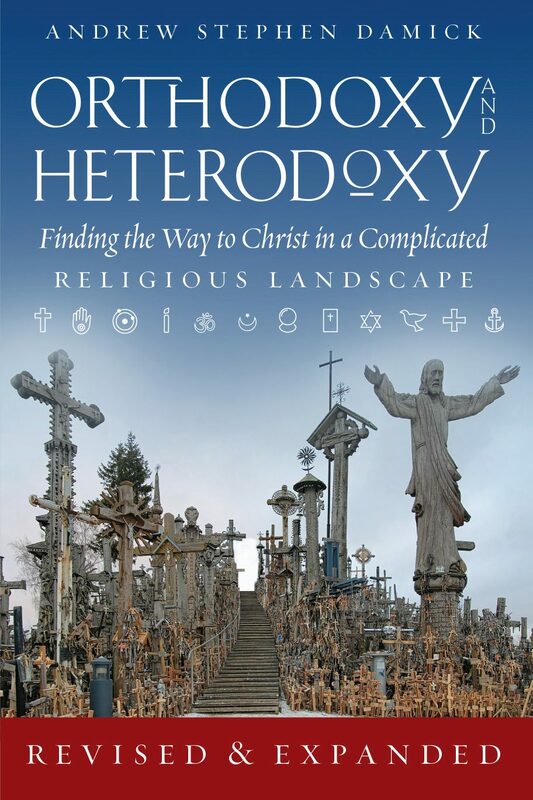 It also subtly underlines many areas of agreement between Lutherans and Orthodox which can be the foundation for any well-meaning conversation. This conversation, I suggest, happens best not on the international level between specially selected representatives, but rather on the local level where the desire is not so much to “negotiate” but to understand and learn from each other in a spirit of mutual respect, as demonstrated by Patriarch Jeremias and the Tübingen theologians and in a more recent example, Changing Churches by Mickey Mattox and Fr. Anthony (A. G.) Roeber. George Mastrantonis, Augsburg and Constantinople. Jaroslav Pelikan, The Spirit of Eastern Christendom (The Christian Tradition, volume 2). The Very Rev. John W Fenton is pastor of St. Michael Orthodox Church in Whittier CA, and Assistant to the Vicar General of the Antiochian Western Rite. He was a Lutheran pastor for 16 years. Do the Orthodox Have Confessions? What Reformers Before the Reformers? thousands to break those vows) there are more than a few problems to deal with. I spent almost 20 years as an Orthodox representative to the North American Orthodox Lutheran Ecumenical Dialogue. The major issue that divides us is the Lutheran acceptance of the Augustinian understanding of original sin and free will. We spent several years discussing these issues and were unable to reach agreement. The Lutherans teach that as a result of original sin, we are born totally deprived and unable to do anything towards our salvation. Orthodox reject total depravity and believe that we can respond by the use of our free will to God’s offer of salvation. Then the radical changes that took place within the Evangelical Lutheran Church such as women’s ordination and the acceptance of homosexuality led to a total break down of the dialogue. How glad I am that you responded. You’re quite right, of course, about modern issues. I’m also convinced that had Martin Chemnitz led the dialogue in the 16ht century, it would have been more nuanced. His views on free will and sin were more reflective of the Orthodox understanding, I think, than those of Jacob Andreae. Thank you Father for a good discussion of the early history of the Lutheran Church and its attempt to contact the Orthodox Church. In the OCA we are seeing more Lutherans converting to Orthodoxy these days and they buy plenty of Icons at our bookstore. I don;t think they are venerating the Saints but at least they are contemplating them. You’re welcome, Nicholas. Glad that you found the essay helpful. And sometimes the mere presence of icons draws one into veneration. One of the greatest kindnesses was a priest who gently asked if he could bless the icon I bought when I was a Lutheran seminarian. I still have that icon, and am convinced it was helpful in my journey. I too, think having Icons around draws a person into a deeper faith. Who knows, perhaps having the Icon garners the Saints attention and they begin to pray for the person who has it. A very useful article. Would it not be possible to view the original Lutherans as the most genuinely “orthodox” given their complete reliance on Scripture as the ultimate authority? Recognizing this as a possibility forms the basis of a mutually respectful, brotherly, Christian dialogue. Of course the situation is complicated by the fact that one nominally Lutheran group (the ELCA) has tragically broken with Scriptural authority on certain key moral issues. Prayerful consideration and vigilance against false doctrine is always imperative for all Christians. A very useful article. Would it not be possible to view the original Lutherans as the most genuinely “orthodox” given their complete reliance on Scripture as the ultimate authority? John, thanks for your comment. I would agree that the early Lutherans were closer to the Orthodox than other Protestants, but not because of “their complete reliance on Scripture as the ultimate authority.” In fact, in the 16th century dialogues, this viewpoint was disputed by Patriarch Jeremias. The Lutherans “closeness,” rather, depended upon their refusal to jettison much of what they had received (Tradition). As Fr Andrew has correctly stated, everyone reads the Scriptures through the lens of a tradition. Perhaps my essay which appears tomorrow will help describe the differences between the Orthodox and Lutheran/Protestant views of Tradition. Even though a full communion between Lutherans and Orthodoxy does not appear possible, that does not mean that the two traditions can not learn from one another. For instance the Orthodox under understanding of the nature of hell and theosis is being embraced bu more and more Lutherans. And Russian Orthodox priests and seminarians have traveled to the United States to learn about pastoral care programs and practices from Lutherans and other Protestants. Interesting. As a Reformed Protestant I welcome ecumenical dialogue!